Hand painted salad tongs are for tossing up a great salad, and what better way than with Clearly Susan's hand painted salad tongs in vegetable garden design. 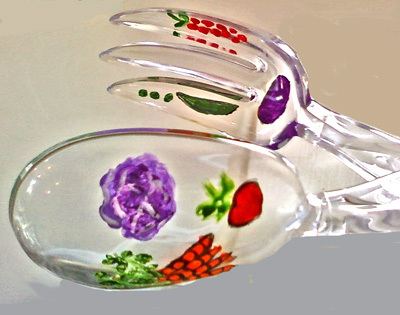 These hand painted salad tongs which are part of our salad serving sets are attached together as a large fork and spoon made of acrylic and hand painted with bright colors of your favorite vegetables. I bought these salad tongs with salad bowl and 4 serving bowls for my mother. She loved them. Bright design, perfect for her kitchen.